Jeep has been a leader in the crossover vehicle segment since the first day it entered the market many decades ago. For those drivers who want a midsize SUV that is comfortable playing in the mud, while also turning heads on the road, the 2016 Jeep Cherokee is the perfect mix of power and elegance, while still being sharp enough to take to the office during the week. When you are ready to experience the 2016 Cherokee firsthand, stop by Sulphur Springs CDJR where we serve buyers from around the Tyler, and Greenville area with one of the best teams of customer service experts ready to meet your car-buying needs. We are available Monday through Saturday, so be sure to schedule a test drive today! Performance wise, the 2016 Jeep Cherokee does a little bit of everything; the SUV can handle the rugged terrain with ease while still being responsive and quick enough to weave in and out of traffic on a busy weekday; whatever you need, the Cherokee can deliver. With two engine options beginning at the 2.4-liter four-cylinder model capable of 184 horsepower and 171 pound-feet of torque, the base level model is equipped to handle anything the road may throw at you. For those Jeep drivers searching for an upgraded experience, the next level engine comes with a 3.2-liter V6 that produces 271 or horsepower and 239 lb-ft of torque on a nine-speed automatic transmission. 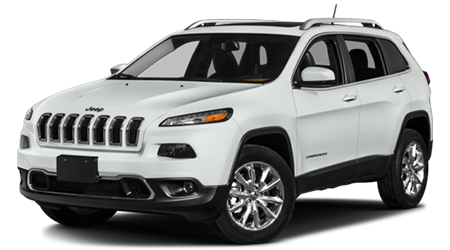 The five-passenger Cherokee also comes in four trim options--Sport, Latitude, Trailhawk and Limited with the entry level Sport including 17-inch wheels, keyless entry and start, reclining rear seats, a rear wiper and a six-speaker audio system. The top-level Limited adds in 18-inch wheels, leather upholstery, dual-zone air conditioners, xenon headlights, heated seats and a power lift-gate. Any version of the 2016 Cherokee, however, will end up being one of the finest and most well-crafted SUVs money can buy. The 2016 Cherokee's interior is quite impressive with high-quality materials and leathers, a sleek dashboard design with impressive trims and accents. The cabin includes the Uconnect 8.4-inch touchscreen infotainment system that incorporates smartphone technology, Bluetooth® and hands-free capabilities into the driving experience to make texting, calling or using a navigation system app a breeze. Overall, the cabin offers a solid amount of front and back passenger space, comfortable seating with reclining capabilities, and an excellent cargo area. The 2016 Cherokee provides one of the best interiors of any SUV in its segments and buyers might never want to leave once they experience it firsthand at Sulphur Springs CDJR. The 2016 Jeep Cherokee earned high marks on both its government crash tests and the Insurance Institute for Highway Safety tests. The SUV earned the highest mark of Good from the IIHS for its frontal-onset, roof-strength, side-crash and whiplash tests and can boast itself as being one of the safest off-road SUVs on the market. The Cherokee also includes anti-lock brakes, an optional rearview camera, multiple airbags, stability and traction controls, forward collision warnings and lane-departure warnings (on certain trims). Overall the 2016 Jeep Cherokee clocks in as safe and secure vehicle and those drivers who carry children or family around do not need to worry about whether the SUV will perform during an accident. Here is a quick list of other excellent features the Cherokee has to offer. The 2016 Cherokee is an SUV that does it all, and when you are ready to grab life by the horns, there may be no better vehicle to help search for that next adventure than in a Jeep. Performance wise the Cherokee lives up to anything in its class or segment and manages to be one of the most exceptional SUVs on the road today. At Sulphur Springs CDJR, our dealership carries a large inventory of all things Jeep, including the 2016 Cherokee, so when you are ready to experience it for yourself, visit us at 1505 Industrial Drive West, Sulphur Springs, TX 75482. Sulphur Springs CDJR remains one of the premier locations to purchase a Jeep for anyone near Tyler, and Greenville.